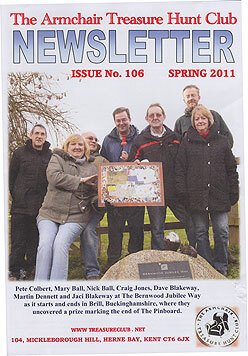 Cover Photo: Pete Colbert, Mary Ball, Nick Ball, Craig Jones, Dave Blakeway, Martin Dennett and Jaci Blakeway at The Bernwood Jubilee Way as it starts and ends in Brill, Buckinghamshire, where they uncovered a prize marking the end of The Pinboard. The Enchanted Garden - Frank Eastham & Roger Lintott give us memories of claiming the red herring and Central Item in Charles’ hunt. Missing Deeds - Katrona Hastings sets us her first treasure hunt. Logica 2010 - Paul Corby tells us the story of this year’s web hunt, with photos from Annika Wolff & Pete Colbert. Bulletin Board - Simon gives us the latest news. September Club Meeting - Stephen tells us the date and place. Make a date in your diary now! The Pinboard - Wish you were here?... The full story of the winners meeting to unearth the final treasure. Three Letter Hunt - Annika tells us how she solved Helen Cook’s hunt, and Helen gives us the full solution. Silver Hare II - Our top investigative journalist interviews Shaun Whitehead about his long running club hunt. Cover Photo: Finders Keepers Solved! Hunt setter Tom Haze meets up with Paul Harkin when he unearths the treasure. The Enchanted Garden - Beryl Murphy shows us photos of her day in Scotland catching red herrings. Finders Keepers Solved - Paul Harkin tells the story of how he solved this classic hunt. 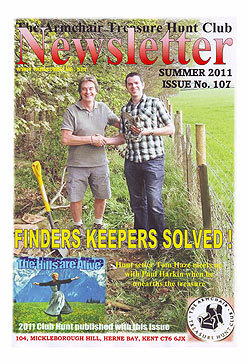 The Hills are Alive - Frank & Roger introduce this year’s club hunt, published with this issue. Jack’s Time Machine - Craig Jones explains how he solved one of the hunts from Dan James’ website. Missing Deeds - Jonathan Wolff tells us how he solved Katrona Hasting’s first hunt. Finders Keepers - The full and complete solution from hunt setter, Tom Haze. September Club Meeting - Make that date in your diary to meet friends old and new, and to enjoy Stephen Miller’s Avebury treasure hunt . Musical Plot - Paul Corby solves this year’s five part hunt. Camera, Lights, Action - The first scene in the four part production set by Ann Hughes & Sandra Young. 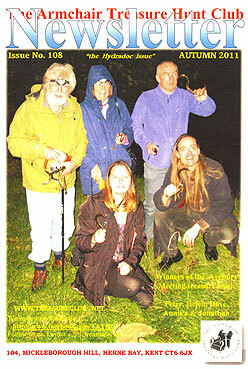 Cover Photo: Winners of the Avebury Meeting treasure hunt. Peter, Helen, Dave, Annika & Jonathan. Silver Hare II - Paul Corby tells us the full story of how he solved Shaun Whitehead’s long running hunt. Avebury Club Meeting - All of the stories, the fun and the photos, from the annual club meeting. Musical Plot - Paul Corby tells us how he solved this hunt and gained his second success of the year. The Code - Martin Dennett tells us how he solved BBC2’s extremely popular treasure hunt. Camera, Lights, Action - The second scene from the hottest blockbuster of the year from Ann & Sandra. Cover Photo: Nick, Pete and Shirley at the Avebury Meeting treasure hunt. Three Letter Hunt - Annika gives us the full solution to this hunt, whilst Pete tells us how he solved it. The Code - Helen Bennett was the first person to submit a correct answer to the BBC's hunt. Here she tells us of her day at Bletchley Park for the final. Camera, Lights, Action - The third scene from this year's Oscar nominayed production from Ann & Sandra.